Pushed for space? Is it difficult to find room for your PC? Then minuscule computer JackPC may be the answer. The true 'thin client' is small enough to fit in a standard power socket, and yet has room for four USB slots and built-in 16-bit stereo sound. 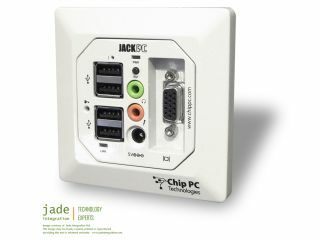 The developer, Jade Integration , says that the JackPC 'will change everything'. Measuring 86 x 86 x 39mm (w x h x d, from back of unit to front), the client is the first to be this small. The standard JackPC is priced at £210. The EFI-6700 has an AMD Au 1550 RISC processor running at 333MHz, 32MB built-in flash memory and 64MB of DDR memory. There's 4MB of video memory, four USB slots and 16-bit stereo sound. The most advanced JackPC, the EFI-6900 , costs £350. It has an identical processor to the EFI-6700 but runs at 500MHz, equivalent to 1.2GHz on a x86 processor. Its flash, DDR, and video memory is double the size of the standard model at 64, 128, and 8MB respectively. Two monitors can be connected to the EFI-6900: one to its DVI port and one to the analogue. The standard models have analogue output only. The mini computers run on Microsoft's Windows CE .net 4.2 operating system, and can run Internet Explorer 6 among other software applications.